Where is Yosemite? 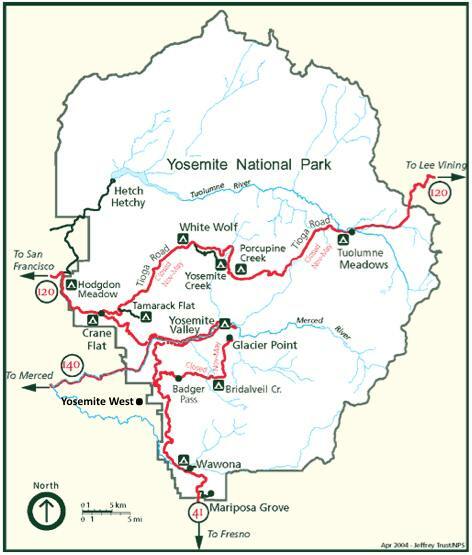 See our map of Yosemite National Park, including google map, and Yosemite Valley map. Yosemite is one of the most beautiful places in the USA, and the entire world. The park is located in northern California in the Sierra Nevada mountain range, a 3 to 4 hour drive east of San Francisco, and a 4 to 7 hour drive from southern California. If you have the time, a visit to Yosemite is a must for your best California vacation. Where is Yosemite? Yosemite National Park is located in the central eastern portion of California, United States, in the Sierra Nevada mountain range. It is located about a 4 hour drive from the San Francisco Bay Area in Northern California, and about 6 hours drive from the Los Angeles area in Southern California. You can open this map to see Yosemite by clicking on Google Map of California Vacation in a larger map. Yosemite National Park can be reached from 4 different entrances. From the west, highway 120 is used from the San Francisco Bay Area and Northern California, or highway 140 from central California. From the south, highway 41 is used to access from greater Los Angeles area and Southern California, and this route offers spectacular tunnel view. During the summer, Yosemite can be accessed from the east over Tioga pass, the highest pass over the Sierra Nevada mountains that run between California and Nevada. I love the scenic route up highway 395 on the eastern side of the Sierra Nevada mountains, where you can enter Yosemite and drive over Tioga pass (open seasonally only). Most visitors come to see Yosemite Valley, shown above on the map of Yosemite National Park. 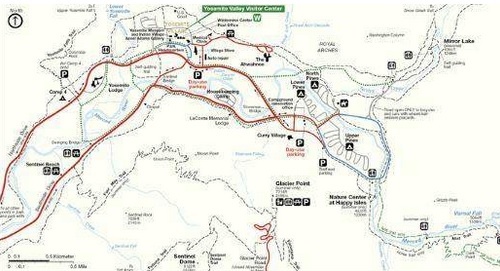 This Yosemite Valley Map shows Yosemite Valley, the heart of Yosemite. The Merced River runs through the valley, fed from the waterfalls and snow melt from the surrounding mountains. Yosemite Valley offers spectacular views of famous sites such as Yosemite Falls, Half Dome, and El Capitan. There are many Yosemite activities and lodging in Yosemite Valley. Popular activities in Yosemite Valley include sightseeing, taking Yosemite photos, viewing the waterfalls, hiking, biking, swimming, and horseback riding. In the winter months, the valley may be covered in snow. For your best Yosemite California vacation, try to stay in Yosemite Valley. Yosemite lodging options include camping, tent cabins, and hotels, including the Yosemite Lodge and 5 star Ahwahnee hotel. Yosemite West, located only 15 minutes away, offers other choices for your overnight stay, including Yosemite Bed and Breakfast, vacation homes, and condominiums for rent.